The quintessential animal print is zebra. Stylish and traditional this zebra pattern will withstand the test of time. A touch of whimsy is added to this design with a ruffled wide hot pink band. 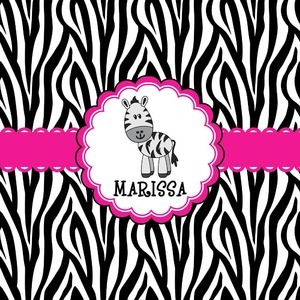 This cute band highlights a scalloped coordinating circle label featuring an adorable zebra. Underneath the zebra there is ample room for personalization of your choice.